The individual goes by various names, including traffic controller, traffic guard, and traffic flagger. But no matter which designation is used to describe this important person, one fact remains indisputable: the individual is vital for the safety of any roadway project. For this reason, Roadway Construction Service has placed great emphasis on the efficiency and expertise of our traffic guards. As a result, we’ve evolved into a highly reliable traffic control company throughout Southern California. When our crews arrive on the scene, clients can count on maximum protection for workers, pedestrians, and motorists. A road traffic controller is not difficult to spot. They’re commonly seen at construction sites and other areas requiring temporary traffic control services. While at these locations, these masters of road traffic safety are responsible for protecting a given area. Traffic flaggers may not be superheroes, but they’re a formidable force just the same. Their primary resource during any project is expert communication skills. Theirs is unique method of communication. Rather than public announcements, a traffic guard’s stock in trade is a selection of very noticeable gestures, signage, and flags. Designed to be seen from a considerable distance, these communication methods are essential for the protection of everyone in the vicinity. Traffic guards are particularly valuable when a two-way road has been narrowed to a single lane. In such situations, these protectors must be razor-sharp. On their shoulders is the responsibility for controlling the flow of alternating traffic. Every motorist has been in this situation at one time or another. First the traffic guard gives one group of vehicles permission to go through the lane; then the same go-ahead is given to the group traveling from the opposite direction. It’s quite a balancing act — and one that requires intensive training and hawk-eyed attention to one’s surroundings. A traffic flagger also contributes to successful road traffic control by regulating traffic density. Depending on the car count in a construction zone, density can thicken to traffic jam levels. Through precise traffic flagging, a traffic controller can slow down or speed up the flow of vehicles to prevent frustrating jam-ups. By doing so, these individuals maximize the efficiency of traffic flow, even in the tightest and most challenging situations. Traffic flaggers sometimes participate in the setup process when needed. If called into service for this purpose, these experts will carry out duties such as setting up warning signs and traffic control barricades. Do traffic flaggers have special hours? Not at all. It doesn’t matter what the time or the weather. If needed, a traffic guard must be ready to respond to all calls for help. Thus, they deserve the highest praise. Clearly, reliable road traffic controllers are vital for the safety and success of work zone projects. 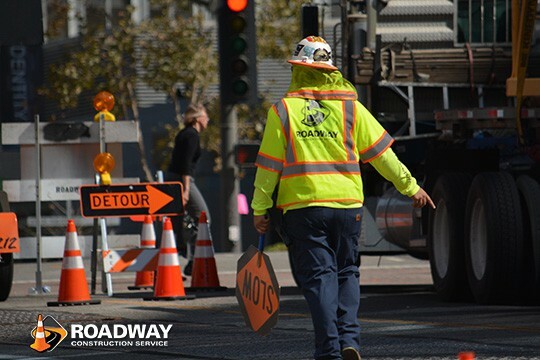 For this reason, Roadway Construction Service focuses considerable attention on this component of our traffic control services. To learn more about why we excel as a road traffic company, reach out to our team anytime. We’ll be happy to provide additional information and answers to all your questions.